Light movers with vented grow lights work in unison to get the grow lamp heat out and off the plants. What is it we need to know about light movers with vented grow lights? And, how does the movement with the grow light mover effect air-cooled hoods? Can we do this with our indoor growing systems? So, the short answer is, absolutely. Light movers with vented grow lights give us super results. And, they work together to get the grow lamp heat out of the grow room and off the plants. The way we make light movers with vented grow lights work is by festooning the ductwork of the vented grow lights. We can simply tie a bungee or cord around the grow lamp ductwork and then tie that onto the Auxiliary Trolley. We can see how that works in the above photo. So, when the grow lamp moves in one direction along the light mover rail, it pulls along the ductwork behind. And while it does this, it pushes the other duct work out ahead. And, when the grow light setup gets to the end of its run, it reverses itself. Then, what was pushed is now pulled along behind on the light mover rail. The ductwork has just enough texture and substance to make this grow light system perfectly operational. Light movers with vented grow lights are easier to set up for our grow light systems than we might think. As we can see, it really involves using the LightRail light mover Auxiliary Trolley along the light mover rail. And for a simple formula, we want to use one of those trolleys on each far end of our line of grow lamps. If we have just one grow light mover, we can position the trolleys on either end. And, we can see how that works in our photo. If we have two or three grow lamps moving with one grow light mover motor, we would do this differently. Then, we would not necessarily need a trolley in between each vented hood, but just maybe two. 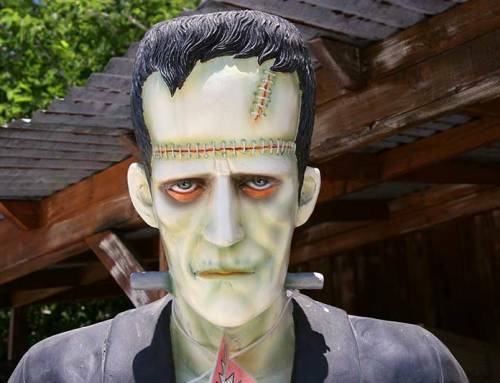 So, we would want one on each far end of the line of vented grow lamps. Light movers with vented grow lights have another important detail to know. With two to three vented grow lamps with ductwork and using an Add A Lamp Kit to move the second or third grow lamp, this is what we do. We would use the trolleys on their own at both far ends of each run. So, the two or three indoor grow lights would be inside the trolleys. Also, because we would be moving the second and third indoor grow light with the Add A Lamp Kit, our indoor grow lights per line of lights will be moving in unison. So picturing that, we can see our grow light systems will work perfectly. And likely, for two or three of our indoor grow lights moving in unison, it would look like this. The ductwork would be connecting all the hooded reflectors in the middle. So, no trolley would necessarily be needed there. Middle trolleys are optional and it depends on our indoor plant light setup and distance moved. An important point to mention about this is we need the grow lamps to move in unison. And, that can only work if we use the Add A Lamp Kits to move the second or third grow lamp. Again, it’s in unison and inline. Here is an important detail that’s a little instruction-like, but worth mentioning. On the far side “A”, we don’t want the trolley to come in between the motor and the switch stop stoppers on the light mover rail. And, that’s because those switch stop stoppers tell the motor to stop, pause and then go the other direction. So, that first trolley will be positioned on the outside of the switch stop stopper. So, it would be positioned somewhere near the end of the light mover rail. We could use a screw near the outside of the light mover rail. Or, we could buy another set of those switch stop stoppers. The point of this is to make sure the trolley that’s securing the ductwork doesn’t run off the end of the light mover rail. An easy way to understand the basic concept is the Motor will make contact. That’s to stop, pause and reverse direction. 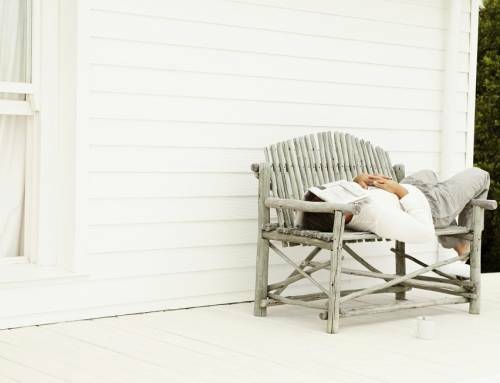 But, everything else needs to scoot by so that it’s not in the way. 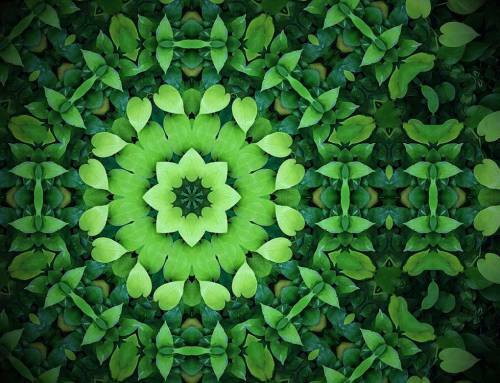 Here’s an article link of a smart grow equipment idea that achieves this. For our second switch stop stopper, we would secure that on the other side of the motor. Also, that distance will total our grow light system travel distance. And, the Add A Lamp Kit, which includes a trolley to hold the second indoor grow light, will do this. 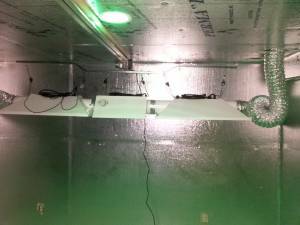 It will mirror the travel movement of our first indoor grow light. And, that second indoor grow light stays on its own light mover rail. So, because that first indoor plant light moves under the motor with stoppers, we will not need any stoppers for that next light. And, that’s because of that mirrored movement of the Add A Lamp Kit. Then, beyond the Add A Lamp Kit and on the far side of the light mover rail “B”, we would do the following. We would put another trolley to festoon the last bit of ductwork. And beyond that point, we would secure another screw or stopper. That’s just to make sure the ductwork doesn’t run off the end. And because everything moves in unison, we are set. 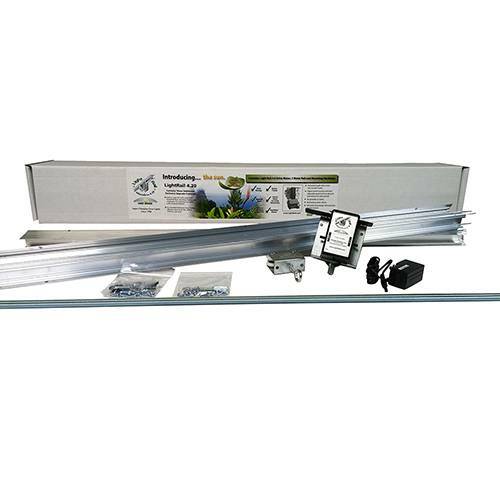 That mirrored movement of the Add A Lamp Kit makes this indoor growing system work really well. 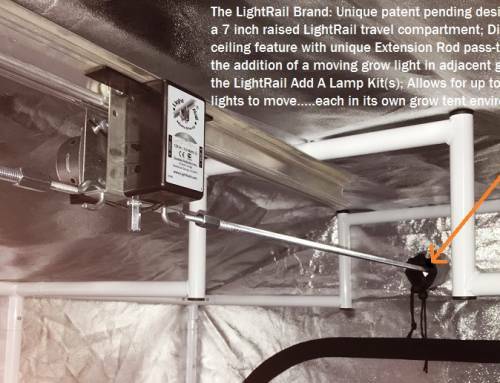 LightRail 5.0 can use vented grow lights in a few ways. Venting up into the ceiling with a curl can work, but the perfect balance is key. One last thing to mention is LightRail 5.0 and vented grow lights. Because of the grow light system detail of keeping the crossbars balanced, we have to mention this. Those crossbars are unique to LightRail 5.0 and they have to be perfectly balanced for weight. But, the tugging of ductwork can be uneven and can create havoc with balance. 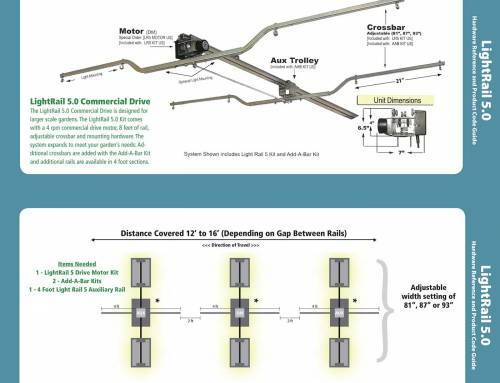 LightRail 5.0 can also work with ductwork if two parallel rails are used to hold the crossbars firmly so that the ductwork does not tug and make for imbalance. 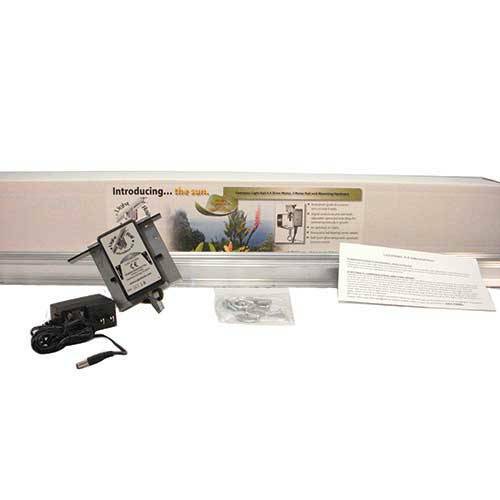 So, using a LightRail 3.5 Kit, a LightRail 4.0 Kit or a LightRail 4.20 Kit is more suited to the indoor grow system with ductwork. If, however, there is no choice, there are a few ideas that have worked for other people’s grow light systems. The photo to the left shows curling the ductwork and venting upward. 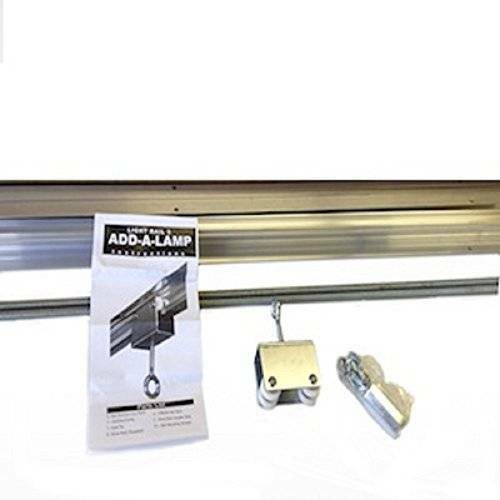 This allows enough slack in the line for both directions of grow light system movement. For perspective, that photo shows the crossbar with three lights and we can see the light mover rail up at the ceiling and come towards us. Another way to go with our grow light systems is to put two lines of rail on the outer perimeter. And, even though we are using our LightRail 5.0 with ductwork, those two outer light mover rails will be LightRail 3.5 rails. 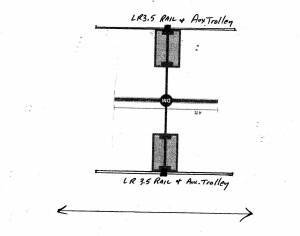 Then, on the two outer LightRail 3.5 rails, we simply put two LR3.5 trolleys. And this time, we festoon our crossbar, each end of the crossbar to a parallel track. We can see a diagram of this grow light system setup to the upper right. Light movers with vented grow lights typically work perfectly in getting the job done. Using trolleys makes all the difference. 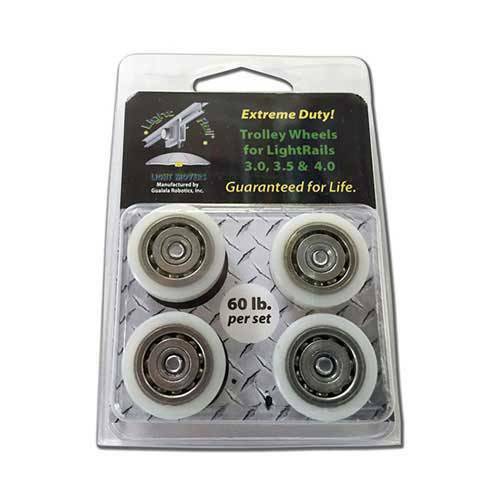 The exception is LightRail 5.0, which is not recommended for use with vented reflectors. But even then and with a little ingenuity, it could be made to work.